Think Before You Pink » Who’s Really Cleaning Up? In 2002, we formally launched the Think Before You Pink™ campaign. 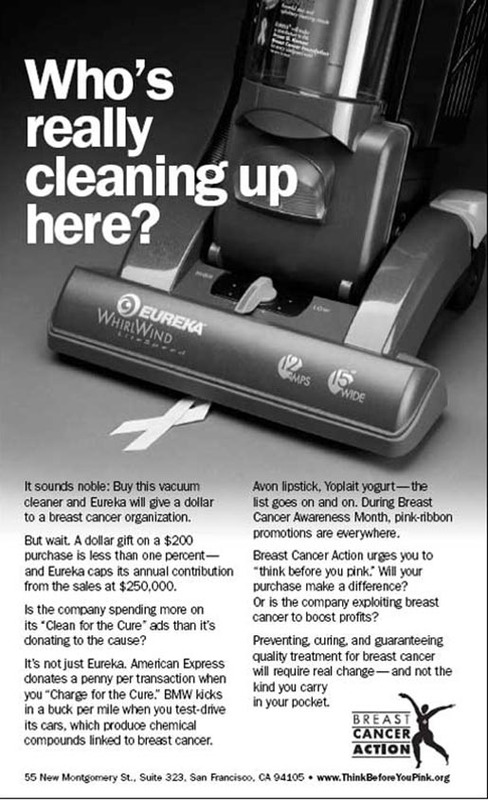 We ran a 3/4 page ad in New York times calling out companies whose pink ribbon promotions did more for company profits than for the breast cancer cause. We also developed thinkbeforeyoupink.org, highlighting critical questions that consumers should ask about pink ribbon products and providing a “Parade of Pink” – examples of products being marketed in the name of breast cancer and how the marketing schemes worked. First and only breast cancer organization to launch a campaign against cause marketing. In response to BCA’s campaign, both Eureka and American Express stopped doing cause marketing.